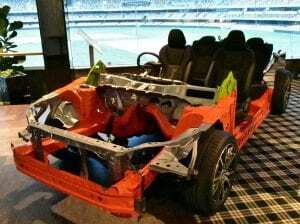 Subaru Australia recently held a products and technology evening at the Gabba in Brisbane to update their Queensland insurance assessor network on the latest structural and passive safety advancements across their range. Over sixty assessors from around the industry attended, which is a reflection of the level of engagement that Subaru has with the industry. The evening was hosted by Andrew Minns, Business Development Manager Collision, who led the discussion during the evening, whilst Gary Pearce, Technical Training Manager, presented the technical content, keeping the audience both informed and entertained in his own inimitable style. Whilst Gary covered a number of individual topics, ranging from the structural integrity of the vehicle to the cutting-edge collision avoidance technology, the underlying theme of the evening was the unwavering commitment to safety that is built into every model across the Subaru range. This only served to enhance the company’s global reputation for safety. However, it was not all talk – there was also some “show and tell”, including the recently-released global platform of the Impreza, which had been cut back to illustrate the range of materials used in the construction and how the design dissipates energy from a collision around the occupants. There was also a variety of airbag pressure sensors, including the latest air-pressure sensors that act to “warn” the airbag sensors that a collision is imminent – clearly Subaru recognises the importance of every milli-second in a collision. Also on show was a range of front and rear-facing vehicle detection radars with a full explanation of the conditions required to ensure they remain fully operational. Finally, the Subaru Eyesight® driver assist cameras were handed around the audience so they could get a real feel of the sophistication of this technology and how it interacts with the plethora of other safety systems in the vehicle. The other “hot topic” was the Eyesight® driver assist camera system and its inter-relationship with the windscreen. Put simply, if either the windscreen or the Eyesight® cameras are removed or replaced, the manufacturer’s requirement is to have the cameras recalibrated – and Subaru supplies a recalibration voucher with every genuine Subaru replacement windscreen. Not surprisingly, the question of access to information was raised and Andrew pointed out that Subaru provides its approved repairer network with full access to its repair procedures and those repairers not in the approved repairer network have access to the information through an outsourced service provider. The discussion also turned to the use of non-genuine parts and, once again, it was no surprise that some of the assessors in the audience were sceptical. Subaru is fundamentally committed to returning any damaged vehicle to pre-accident condition and, to that end, only genuine replacement parts that have been imported and distributed by Subaru Australia come with the Subaru-backed manufacturer’s warranty. In his wrap-up, Andrew Minns was unwavering in Subaru’s position when he said: “The underlying principle is to ensure that the safety systems in a repaired vehicle operate just as well as they do in a new vehicle in the interest of the safety of the occupants,” referring to the question of calibration. “Our position in respect to the use of non-genuine parts is based on the same fundamental commitment to the safety our customers,” he added. Throughout the evening, I had the opportunity to interact with many of the assessors and it was clear that it was an overwhelming success. Subaru has invested a significant amount of time and energy engaging with those who provide the work to their approved repairer network and this event was yet another example of their commitment to the industry.